Delegates listen to the debate while waiting to speak on a resolution. 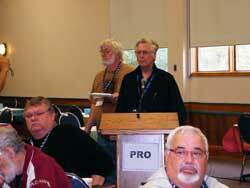 Resolutions passed at CURC’s 10th Constitutiona; Convention addressed a wide range of retiree concerns. • lobby the government to provide full disclosure of items being negotiated in the Canada-Europe Trade Agreement (CETA) and in conjunction with other retirees’ organizations, will oppose any provisions of CETA that would increase the cost of drugs in Canada. • state its absolute opposition to the efforts of employers and governments to establish two tier wages and two tier pension benefits. • lobby federal political parties, in cooperation with the labour movement, to change the law to make pension funds secured creditors under bankruptcy proceedings. • denounce the lack of services to seniors living in long-term-care facilities and pressure governments to provide the highest standard of care to these senior residents. • continue to support universal public postal service and oppose post office closures and the the privatization or deregulation of Canada Post. • work with the CLC for the eventual UN recognition of the Day of Mourning for workers killed and injured on the job, April 28. • urge the federal government to ban the use of temporary workers (scabs) during a strike or lockout. • support legislation to permit physician-assisted suicide for consenting adults who are terminally ill.
A number of resolutions on the CURC Constitution and membership issues were also adopted. Resolutions on the HST, green jobs, asbestos and abolishing the Senate were referred to the Executive Committee for further consideration and action.